East Jakarta Transportation Sub-dept. (Sudinhub) deployed 90 personnel to socialize about odd-even traffic system implementation for cars in several road points. His side also counts vehicles as an evaluation towards effectiveness of socialization that has been done.
" 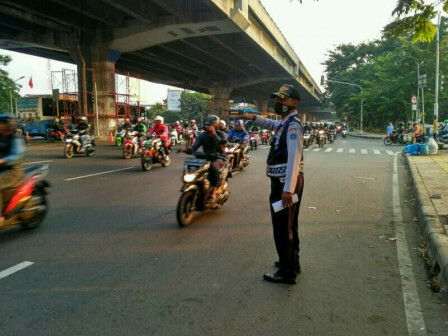 Personnel will count passing cars with odd number and even number plates each second"
Those personnel is placed in 10 spots along Jalan Mayjen Soetoyo, DI Panjaitan until Jalan Ahmad Yani. They will count passing cars every second. East Jakarta Sudinhub's Traffic Section Head, Andreas Eman mentioned, his personnel will count every passing cars to know total cars with odd number and even number plates each second. "Entering this second week, we are still socializing the policy and not yet ticketing those who break the rules. Personnel will count passing cars with odd number and even number plates each second. Passing cars volume is not yet known," he said, Monday (7/9). According to him, his side continues to intensify his coordination with related units. Such as with urban village and sub-district sides thus they will help socialize the policy to residents in order to optimize socialization result. "We also asked for urban village and sub-district heads to socialize it to residents thus they will know exactly where and when the odd-even traffic system applied ," he mentioned.